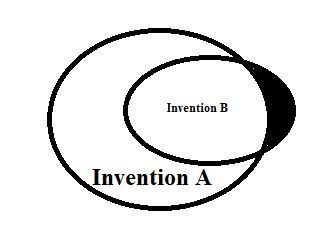 I have a prior art invention - invention A; My invention - "invention B" has most claims common to that of Invention A. But while structuring the claim, and speaking from perspective of invention, I will have to write few claims which looks similar to claims of prior art. If I do not include those steps in my claim, my claim becomes unsequential. Among all my claim steps, how will I really mention that one or two things really novel about my invention? Or is this only possible while describing background and detail description of invention wherein I compare drawbacks of prior art and what my inventions bring with itself. The reason I am wondering this is because it isclaim which really decides on what I am claiming in my invention. In figure above, shaded part only is my invention and rest all elements in claim will match claims of invention A. It would be a very rare invention that consists entirely of a new thing with no previously existing components. Instead, an invention typically relates to a known thing with a bunch of known features, along with something new. As such, claims to inventions will typically include a bunch of components which are well known and add nothing to the novelty of the claim. This does not mean they are optional or unimportant. Instead, these known features are provided so that the claimed invention would work, and to show how the new bit would function in context. You should be able to point to something in each of your claims which is novel. It doesn't have to be much, but there should be at least some difference (which should hopefully also be non-obvious). So where do I point to the novel bit? This is actually a controversial point, which underlies a cultural split between US-style drafting on one side and European-style drafting on the other. In the US, it is traditional not to precisely identify what the differences are. Instead, this is couched in generalities. You might say "claim 1 differs at least in feature X" or that "the prior art fails to precisely disclose feature X". However, you would rarely say "the novelty of the invention is feature X". Moreover, these pronouncements typically occur during prosecution. You would not generally provide any indication in the claims or the description. The reader of a patent application drafted in US-style, without any knowledge of the prior art, would therefore typically not be able to work out the novel bit. In Europe, it is much more common to set out in the background what the prior art teaches (at least in general), and how your invention differs and improves on the prior art. This is typically done in the description itself, and may be reflected in the claims by using two-part form. One approach is not better than the other. Instead, the difference in approaches reflects a number of factors (such as prosecution estoppel in the US and the requirement for inventive step in Europe). Aside from consulting an attorney, you should look at related patents in your preferred market: if the US is critical, focus on US-originating patents. Notice to what extent they describe the prior art, and how they set out the benefits. You should get a feel for it: it is hard to be more precise than that. Not the answer you're looking for? Browse other questions tagged claims specification or ask your own question.